DoubleDragon Properties Corp., the property development firm of self-made billionaire Edgar “Injap” Sia III and Jollibee Foods founder Tony Tan Caktiong, increased its net income by 71.8% to Php2.53 billion last year from Php1.47 billion in 2016. In a media release, the company explained this growth was brought by the increase in its rental revenues, which surged by 238.4 percent from a mere Php268.7 million to Php902.2 million in 2017. As of 2017, DoubleDragon has completed a total of 332,500 square meters of leasable space. The real estate company revealed that its recurring revenue more than tripled last year to Php1.3 billion from just Php347.6 million in 2016. DoubleDragon aims to be a 90-percent recurring revenue company by 2020. An average of 95.3 percent of the first 25 CityMalls, the company’s brand of community mall chain, is already leased out as of 2017. DoubleDragon expects a total of 50 completed CityMalls by the end of 2018. 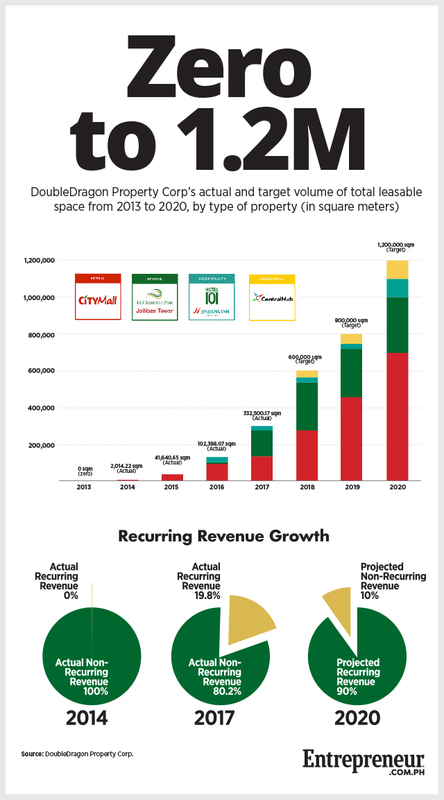 As well, DoubleDragon targets its total leasable space to reach 600,000 square meters this year, 800,000 square meters by 2019 and 1.2 million square meters by 2020. More than half of the group’s total leasable space will be in CityMall branches, and the rest will be allotted for office spaces, hotels and industrial warehousing establishments. “I am personally glad for the progress we have made in the past three years as it has been essential in putting together the solid building blocks that will serve as the bedrock of a company designed and built to stand the test of time,” added Sia, who is DoubleDragon’s chairman. DoubleDragon is the country’s sixth biggest listed property firm by market capitalization as of March 2, at Php8.44 billion. Sia is the 21st richest man in the Philippines in 2017 according to US magazine Forbes, with a net worth of $820 million. Tan Caktiong, Sia’s partner, ranks eighth with $3.4 billion.